Calling all sports fans! The Commonwealth Games are heading to the Gold Coast in Australia in 2018 and we're delighted to announce that Flight Centre is the only UK high street travel retailer licensed to sell tickets to the exciting event. Set to take place from 4 April to 15 April 2018, the games will see over 6,600 athletes and team officials from 70 nations and territories converging in the Queensland beachside city. The event will be the largest sporting event Australia will see this decade and the biggest sporting spectacular the Gold Coast has ever seen, offering the perfect opportunity to not only witness the games but enjoy a sun-soaked Australia holiday in Queensland. To celebrate the games and our renewed partnership with Tourism & Events Queensland, we recently turned our Flight Centre Gordon Street store in Glasgow gold. 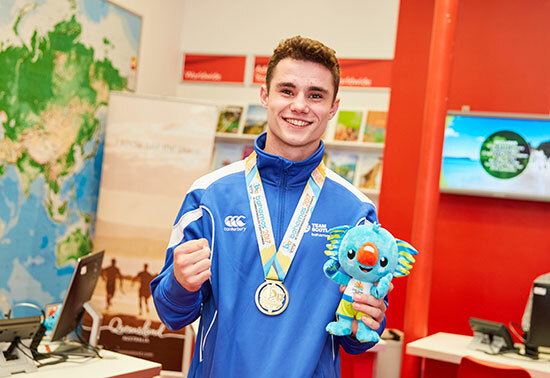 On the day customers also had the opportunity to win one of three £1,000 Flight Centre vouchers and enjoy a meet-and-greet with gold medallist boxer Tyler Jolly. Jane Nicholson, International Director of UK, Ireland and Nordic Region at Tourism and Events Queensland, said: “We were delighted to kick start our renewed partnership with Flight Centre in such a glittering way; bringing a slice of the Gold Coast to Glasgow. The campaign theme ‘There’s so much competing for your attention’ perfectly sums up Queensland, with its must-see destinations, delicious food, memorable activities and views for days. To be part of the fun and excitement at the Commonwealth Games 2018 and enjoy a Queensland holiday while you're there, talk to one of our Experts on 0800 587 0058 from a landline, or 0333 333 2211 from a mobile.